This year marks Google's 20th anniversary and despite countless articles that have proclaimed 'the death of SEO' getting significant attention during that time, SEO proves to be one of the most effective channels available to marketers year in, year out. The numbers are quite compelling. Study after study shows email marketing and SEO to be the stand-out channels in terms of return on marketing investment. 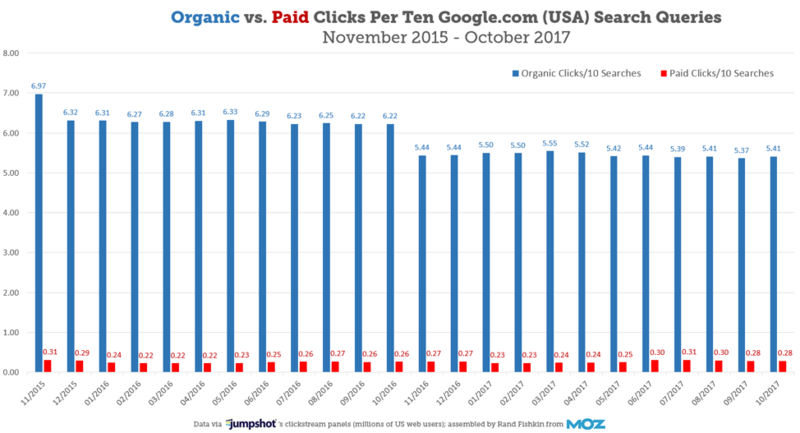 And while email marketing is experiencing a resurgence in terms of interest and budget allocations, there still exists a significant ambivalence towards SEO which sees most brands massively underinvested in this channel. 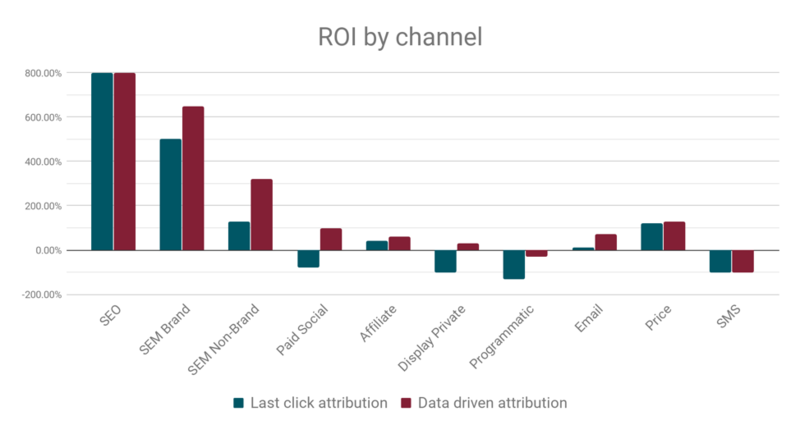 While we often see ROI analyses similar to the one below that show SEO as the top performing channel it's not unusual, but rather disconcerting, for major brands to put little more than 10% of their digital marketing budget into this stand out channel. And despite the fact that Google has given more screen real estate to paid search results and various rich results such as featured answers, SEO still delivers about 20 times as many clicks as paid search. This begs the question, "why are we so incredibly underinvested in SEO?". And the answer is probably "because we are doing it wrong". As a result, we remain justifiably unconvinced that our SEO efforts are paying off. Even if organic search is currently producing strong results there's a sense of frustration and doubt that our investments are to be directly credited with the progress being made. This is in large part due to the fact that most SEO agencies, at best, tend to work on a relatively small set of perhaps a few thousand keywords. And most will focus on improving rankings on head keywords where there are larger search volumes because it would appear to offer a better return on the investment required in producing and maintaining a piece of content for each need. The truth is there's a vicious cycle at play here since reduced faith in the channel leads to reduced investment and reduced investment leads to smaller thinking, less effective actions and less clear outcomes. As such, many enterprises could act smarter in terms of being a 'mature buyer' of SEO services but the responsibility lies firmly with the agency in terms of proving their value and inspiring greater action. We must also recognize that most enterprises do not have established SEO functions operating as an integral part of their overall digital marketing system (what we refer to as their Digital Growth Engine). As a result, SEO is inevitably about change leadership which can be particularly painful and ineffective if either party fails to recognize that fact. The likely outcome is that the SEO provider sends a never ending list of tasks for the client (or other partners) to implement rather than using those tasks as an opportunity to establish new and improved workflows. Brands are right to be sceptical about chasing rankings on a few priority keywords! That is a small business mindset towards SEO. For large enterprises, such an approach will simply not have a noticeable business impact. As such, we must rethink enterprise SEO if we are to scale things to the point of producing a significant business outcome. Instead, we should be working to get brands ranking somewhere in the top 10 for tens of thousands of additional needs relevant to their business. Transformative SEO is the name we at Nordic Moring have given to this approach which delivers real business outcomes for large enterprises. The most fundamental aspect of SEO is to identify and produce one preferred landing page for each need of your target audience so you can deliver content that addresses that need better than anyone else. It requires market driven content planning. The important thing is achieving that with extreme precision so that we have no overlapping or competing content and no content gaps. Perfectionism in this process will make it much easier for search engines to identify which piece of content is your best for each need. Transformative SEO requires this level of precision across tens of thousands of different needs and then architecting those many content pieces into a site that is easy for users and Google to navigate. It requires precision at scale. It also requires the ability to drastically reduce the cost of content production and maintenance and increase the rate of production so that we can achieve the scale needed. It requires content velocity. Content velocity can be achieved in various ways. For example, in some markets it might be appropriate to develop smart content solutions with faceted navigation that produce and architect tens of thousands of pages of market driven content into a neat and effective solution very quickly and cheaply. This is the approach taken by a leading player in the food retail industry rebuilt the recipe section of their site and launched 50,000 precisely targeted landing pages for search which increased their already dominant position in that market. By investing in this smart content solution, they were able to address the recipe needs of more Swedes than any other brand. This sort of solution requires new thinking, it requires the design and build of custom marketing technology to achieve the precision and scale needed, and it requires significant investment. But it does change the game by allowing brands to break through the limitations of manual content creation for SEO. And it delivers content velocity and an incredible return on investment for those willing to work for such a solution. Such smart solutions make it undeniable that our SEO efforts are paying off which gives a renewed belief in the channel and helps break that vicious cycle. And it does this by delivering significant business results for major brands by completely transforming the way we think about or drive our SEO initiatives.